In the afternoon of March 6, 2019, peals of thunder could be heard rumbling above the sky of the Holy Miracles Temple, sounding like giant earthquakes and landslides. The rain came pouring down rapidly. The Grand Hall of Shakyamuni Buddha at the Holy Miracles Temple was crowded with nearly a thousand Buddhists from all over the world. Holding khatas with both hands, they kneeled to respectfully and sincerely welcome the greatly accomplished holy guru, Wangzha Shangzun. Wangzha Shangzun is a great holy guru who has attained the level of Gold Button Grade 3. In this lifetime, He has followed H.H. 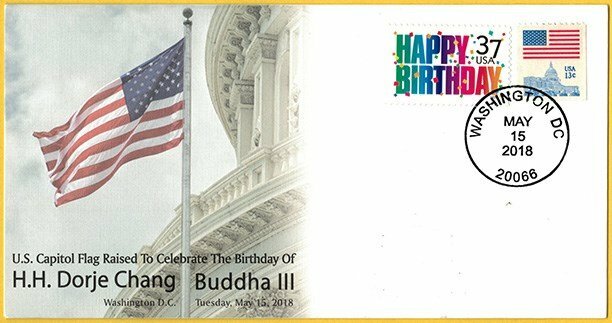 Dorje Chang Buddha III to learn Buddha-Dharma and has attained tremendous accomplishment in holy realization. The Shangzun is considered the one and only Venerable King of Extraordinary Strength within the field of Buddhism throughout the entire world. He once conducted the Vajra Fa-man Holy Selection Grand Dharma Assembly during which He performed the Determination by Holy Selection in accordance with the Dharma and arrived at the determination that H.H. 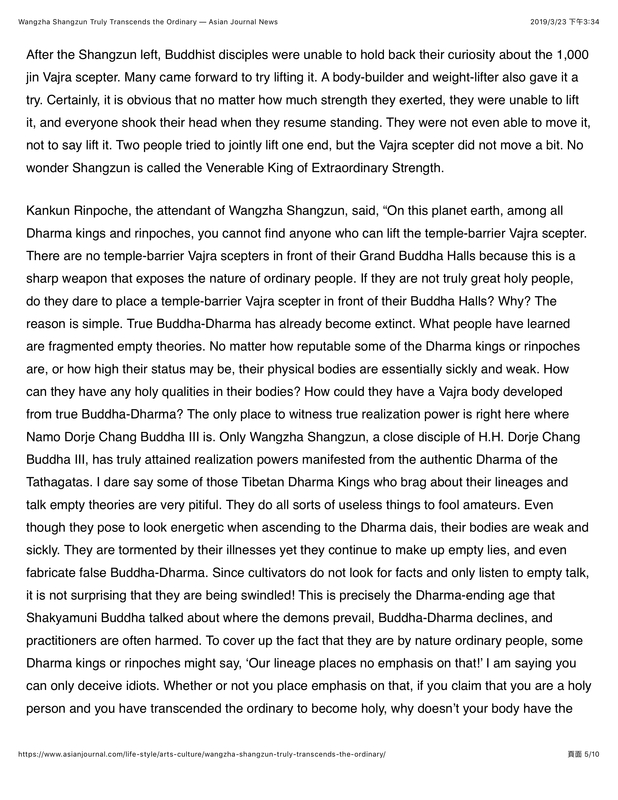 Dorje Chang Buddha III is the true incarnation of the primordial Buddha. In 2016, Wangzha Shangzun personally presided over the holy exam held by the World Buddhism Association Headquarters for Dharma kings, rinpoches, Dharma masters, masters, and acaryas around the world. In establishing the Samsara Eight-Wind Array and Vajra Array, and with his holy realization, the Shangzun determined through Holy Selection the grade levels—the levels of accomplishment—of nearly 10,000 Buddhists. That astounded the world! The Shangzun is, however, indifferent towards fame and fortune. In the past few years, He devoted himself to Dharma affairs of saving living beings. He rarely sees regular Buddhists except for seeing a very small number of high-level Buddhists. With the near-completion of the Dipankara Buddha Hall in the Holy Miracles Temple, and upon repeated requests by the monastics of the temple, the Shangzun has finally agreed to go to the Dipankara Buddha Hall periodically to chant sutras and mantras, to perform Dharmas, to pray for and bless faithful Buddhists who light lamps to beseech blessings. It was only under this karmic condition that the Shangzun agreed to publicly meet with Buddhists regardless of their level of accomplishment. In the evening of March 6, Wangzha Shangzun arrived at Holy Miracles Temple. He walked with firm and stately pace as if a Vajra deity was descending to a mandala. 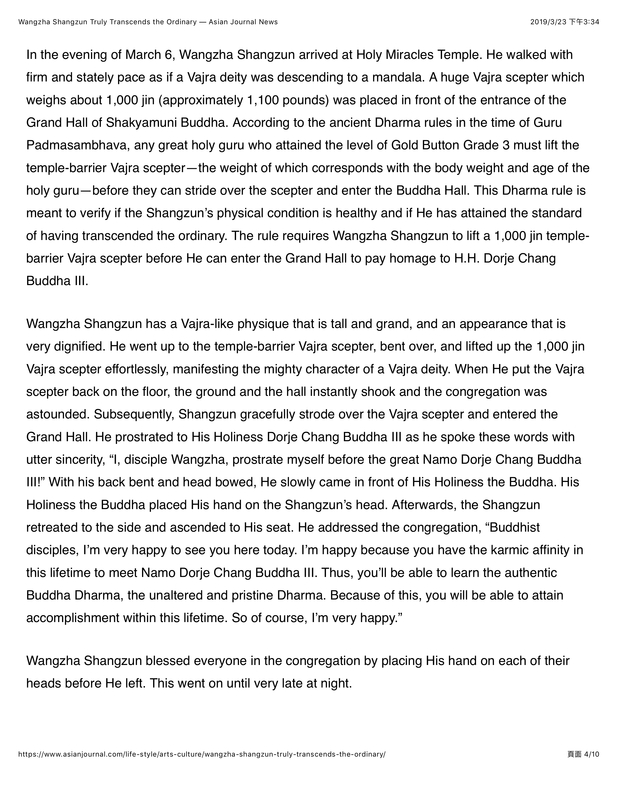 A huge Vajra scepter which weighs about 1,000 jin (approximately 1,100 pounds) was placed in front of the entrance of the Grand Hall of Shakyamuni Buddha. According to the ancient Dharma rules in the time of Guru Padmasambhava, any great holy guru who attained the level of Gold Button Grade 3 must lift the temple-barrier Vajra scepter—the weight of which corresponds with the body weight and age of the holy guru—before they can stride over the scepter and enter the Buddha Hall. This Dharma rule is meant to verify if the Shangzun’s physical condition is healthy and if He has attained the standard of having transcended the ordinary. The rule requires Wangzha Shangzun to lift a 1,000 jin temple-barrier Vajra scepter before He can enter the Grand Hall to pay homage to H.H. Dorje Chang Buddha III. Wangzha Shangzun blessed everyone in the congregation by placing His hand on each of their heads before He left. This went on until very late at night. After the Shangzun left, Buddhist disciples were unable to hold back their curiosity about the 1,000 jin Vajra scepter. Many came forward to try lifting it. A body-builder and weight-lifter also gave it a try. Certainly, it is obvious that no matter how much strength they exerted, they were unable to lift it, and everyone shook their head when they resume standing. They were not even able to move it, not to say lift it. Two people tried to jointly lift one end, but the Vajra scepter did not move a bit. No wonder Shangzun is called the Venerable King of Extraordinary Strength. 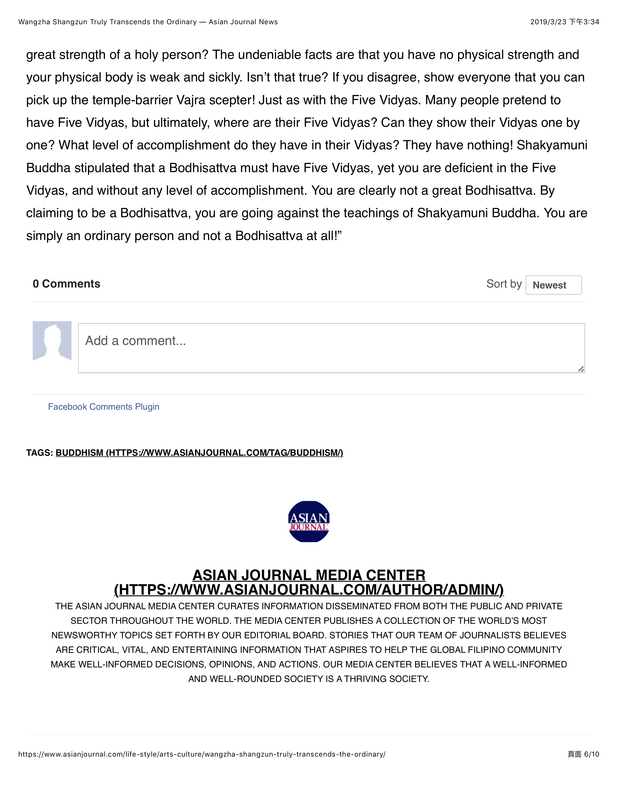 More related Information at: https://dharma-hhdorjechangbuddhaiii…. Homage to H.H. Dorje Chang Buddha III. The 2011 Hong Kong Conference of Buddhism.